‘Friends are the family you choose for yourselves’ is a saying often seen written on plaques sold at homeware shops and designed to be displayed on people’s walls. And while the sentiment is a fair one, from a Christian point of view it seems to rather miss the point. 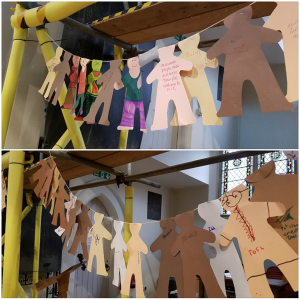 Last Sunday our Children, Families and Schools minister was taking the all-age service on the subject of family. The traditional idea of family as a group of people to whom one is related, was discussed but then extended to include our church family and the adjectives the congregation had chosen to describe families were then applied to our church family. And this is where the difference between friends and family is so apposite. Families teach us things precisely because we cannot choose the members for ourselves. When we choose our friends we, by and large, choose people like us; in age, occupation, hobbies, temperament, and then we have lots in common and fewer differences to divide us. Our family, however, might have our genes to connect us but often very little else. If you substitute genes for faith then this is like church! Church relationships can be strained and uncomfortable, or even difficult but we are a family and that means that we have to behave like one. As Neil pointed out, the whole Bible is about God building a family with whom to share his love and it culminates in our adoption into his family through our faith in Jesus Christ. Ephesians 1:5 says “God decided in advance to adopt us into his own family by bringing us to himself through Jesus Christ. This is what he wanted to do, and it gave him great pleasure”. Every child in the world is born into the universal family of humankind but each child also requires a specific family to love, teach, nurture, care for and support them. 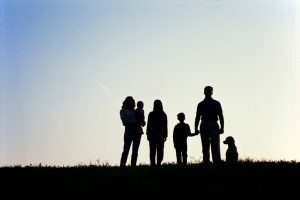 When we were born again into God’s family, the same was true; we are all the universal family of Christians but we each need a specific family, provided by the church we belong to. God loves relationship. The Trinity itself (after which our church is named) is a relationship and we are called to emulate its harmony. Which, it has to be said, is hard work! As we were reminded on Sunday, family members offer one another tolerance, respect, encouragement, teaching, quality time, challenge, and support. So how can we offer that to over four hundred other members of our church? And how can we do that when we are all flawed and selfish? God wants us to learn to love everyone, that is why Jesus identified this as the foundation of every commandment, but he is especially keen on us loving others in his family so that we can develop the skill of loving, and by seen by others as treating one another with love. 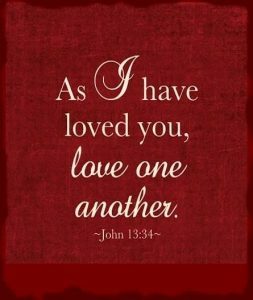 Jesus points this out in John’s gospel when he says “ As I have loved you so you must love one another. By this everyone will know that you are my disciples, if you love one another.” We can’t witness to the world without showing love to others, and we can’t learn to love when in isolation. Family is the perfect way to hone the skill of loving. In families we learn to love those we find irritating, imperfect or frustrating. Church is our eternal family and so, in heaven, we will enjoy fellowship with them forever but we need preparation. And that means learning to love our family members now. What do we all need to change to be more tolerant, respectful, encouraging, to teach others, to give time to others, to challenge others and to be supportive? To read more about our church family try Matthew 12:46-50, Matthew 25:40, Ephesians 2:19, 1 Timothy 3:15 and Hebrews 2:10-13.